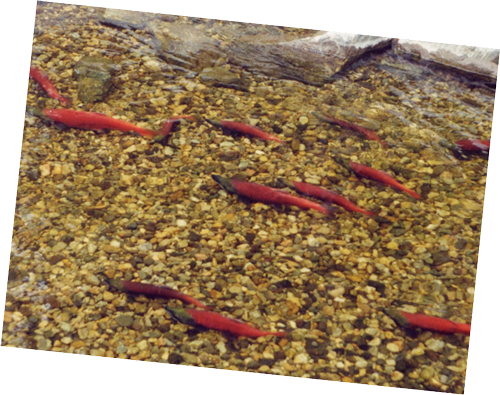 Kokanee salmon adult migrations into Mission Creek have dropped from 80,000 to less than 8,000 over the last 25 years. A 90% reduction in the availability of spawning habitat due to channelization after dyking the creek is thought to be the cause of this decline. In 1988, prior to the formation of the Friends of Mission Creek Society, a major project was undertaken to increase spawning habitat with the building of a 1 km spawning channel. It is active today and can be visited immediately across the Creek from the EECO. In 2000 gravel enhancement within the creek was attempted using a riffle with prospects that 30 riffles could be introduced into the creek. Starting in 2004 a major initiative was begun to setback the dykes, permitting the creek to re-naturalize with meanders and gravel complexing that would be more conducive as spawning habitat.